This guide covers Chaucer’s The Wife of Bath, both the Prologue and Tale, and focuses of the A2 OCR unit F663, Section B – but the guide should prove very useful to anyone teaching these Chaucer texts for any other exam board. The OCR unit itself requires a comparison with another text, and in this guide, that text is Sheridan’s The Rivals – thus, teachers will find much that is useful for this play here also. So, your students have battled their way through the AS. They’ve managed to write compellingly on the poetry of Yeats (or Dickinson, or Thomas or Browning) and they’ve demonstrated they know everything there is to know about The Turn of the Screw or Jane Eyre (at least if you were smart, and didn’t try to inflict The Secret Agent or Mrs Dalloway on a class of 16-year-olds!). But now, it’s all about preparing them for F663. And, unfortunately, it’s quite a challenge. Below you will find a general guide on how to deliver this difficult unit. 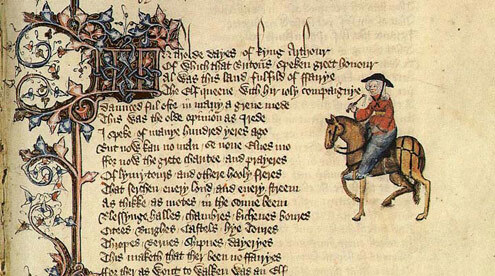 The guide focuses on offering some ideas to help prepare pupils for the examination on one of the poetry text choices you might like to make: Chaucer’s The Wife of Bath’s Prologue and Tale.